Transfer Deadline Day: Which players will be on the move? Will Yannick Carrasco join Arsenal? It's Deadline Day, which means time is running out for players to move. Clubs in England have until 11pm to do business on January 31, but which names are in the frame as the clock counts down? The Transfer Talk podcast reveals PSG's plan to make Arsene Wenger their general manager. Having seemingly failed in their attempts to sign Ivan Perisic from Inter Milan, Arsenal have turned their attention to former Atletico Madrid winger Yannick Carrasco. Sky in Italy are reporting the Gunners are in talks to sign Carrasco from Chinese side Dalian Yifang. If a deal is done it is likely to initially be a loan move, but Carrasco's agent, Christophe Henrotay, has warned that time could be a factor. He told Radio Rossonera: "Everything is possible but it seems difficult to do. It would need decisive and rapid movement by the interested clubs involved to discuss and deal with the current club of Carrasco." Leicester look as though they are going to win the race for Monaco midfielder Youri Tielemans. The Foxes are aware of interest from Arsenal, West Ham and Newcastle, but want to sign the 21-year-old on loan until the end of the season with a view to a permanent move in the summer. The deal could see Adrien Silva move in the other direction. It looks as though Marouane Fellaini's time at Manchester United has come to an end. The first major signing of the post-Sir Alex Ferguson era, Fellaini has sometimes been a divisive figure at Old Trafford, but has also played a part in some important goals. Despite signing a new deal last year, the midfielder now looks set to join Shandong Luneng. There's no rush with this move as clubs in China are able to complete deals up until February 28. Deadline Day could be busy for Newcastle. 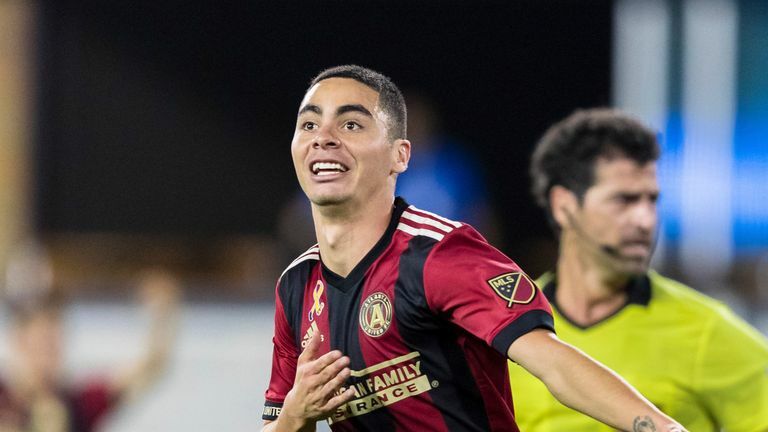 Miguel Almiron is set to sign for a club-record fee from Atlanta United, and he could be joined by a couple of other new faces. Newcastle are understood to be in talks with Benfica over the signing of midfielder Andreas Samaris, and with Monaco for defender Antonio Barreca. Having fallen down the pecking order at Chelsea, could Andreas Christensen leave? It has been reported that Juventus and Borussia Dortmund are both ready to launch late bids for the defender, who has only started one Premier League game this season. Olivier Giroud, meanwhile, admits he is considering his future at Chelsea following the arrival of Gonzalo Higuain. Giroud's contract is up in the summer and he says he is thinking about a move back to France. "If the club decides to get another striker, like Higuain, it will certainly darken my future at Chelsea," he told Canal in an interview released on Sunday. "I have never said no to a return to France. Lyon and Marseille are two great clubs. My priority is to stay in the Premier League though." West Ham are close to agreeing a deal with Celta Vigo that would see striker Maxi Gomez arrive in the summer, according to Sky sources. The Hammers are set to sign Gomez for around £40m, despite Marko Arnautovic ruling out a move away from the club. Gomez has scored nine goals in 19 La Liga appearances this season for Celta Vigo. Paris Saint-Germain are still trying to sign Idrissa Gueye. The 29-year-old has asked to leave, begging Everton not to end his dream of joining the Ligue 1 side. However, Sky Sports News have been told PSG remain unwilling to improve their initial offer of £21.5m for the Senegal international. Will that stance change before tonight's deadline? Javier Hernandez is keen on a move to Valencia and West Ham are willing to sell him this month, according to the Spanish side's manager Marcelino. Sky Sports News reported earlier this month that Hernandez is eager to leave the Hammers because of his lack of game-time, and that Valencia are interested in bringing him to La Liga. Hernandez has started seven Premier League games this season, scoring four goals in 15 games in all competitions. Southampton are listening to offers for striker Charlie Austin, according to Sky sources. Austin has made 18 appearances this season, scoring three goals, but has only started two league games under manager Ralph Hasenhuttl. Blackburn and Stoke have both been linked with a potential move for the striker. West Ham are considering making an approach to take Chelsea striker Michy Batshuayi on loan, Sky sources understand. The Belgium international has spent the first half of the season on loan with Valencia, but has not played since a 2-1 defeat to Sporting Gijon on January 8 as the La Liga side attempt to cut short his spell. West Ham are in the market to add depth to their front line this month, although according to the Guardian, they may face competition from Everton for the player's signature as Chelsea look for a permanent £35m move for the forward.